The year I turned 40, a wart grew on my face. No kidding. Since my birthday was close to Halloween, I figured all I needed was a black pointy hat and I was in business. Now, that’s some way to be welcomed to middle-age-hood. I tried all the old wives’ tale remedies, to no avail. I bought every product known to Wal-Mart, but no luck. I finally went to a doctor to have it frozen and removed. 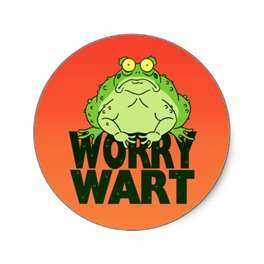 That’s where I found out a wart is actually a viral infection, often tied to stress. How’s that for motivation to unload some of that anxiety? The term “worrywart” intrigues me. It’s defined as, “an habitual worrier”. I’ve heard people say, “Oh, I guess I’m just a worrywart!” like it’s a title of which to be proud. But who would honestly want to be labeled as a wart of any kind? According to the dictionary, the word originated in 1930. America was in the Great Depression, Al Capone was on the loose, and most citizens wanted the Prohibition laws repealed. I guess there was plenty to worry about. The term has Old English roots from the word “worryguts” which means “a person who tends to worry about insignificant matters.” Our guts do seem to take a hit when we’re in the habit of worrying. I think Jesus was making a point: worry doesn’t add a centimeter to our height or an hour to our day. In fact, all of our anxieties tend to weigh us down and steal away our time. And turn us into warts. This entry was posted in Devo Drops and tagged warts, worry. Bookmark the permalink. Sometimes the stress and worry popps out as cold sores instead of warts- very painful, very ugly, very contangous (no one likes to kiss you). As someone said to me yesterday -Oh you have a cold sore, I get those too, my mom said it was my stubburness coming out. What a thougt. Subbmission to Our Lord (not stubburness) + prayer= no cold sores/ warts.